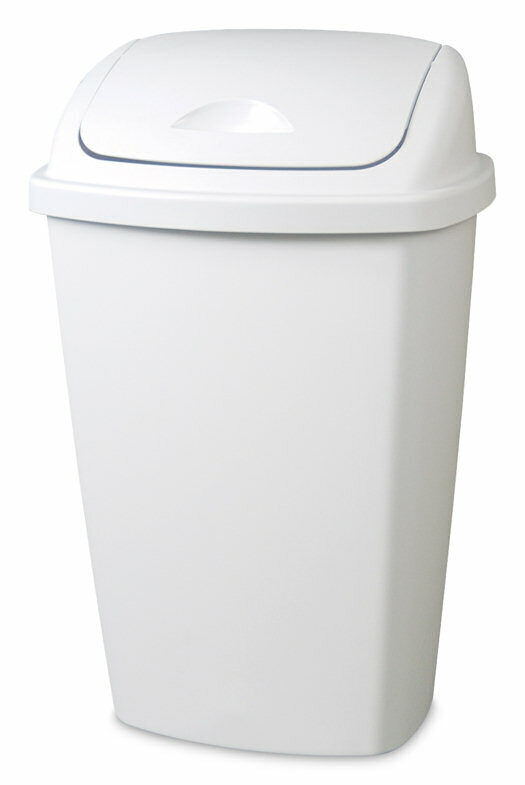 The 13.2 Gallon SwingTop Wastebasket is an ideal solution for larger areas of the home. It has a dual-action swing-top feature that allows the lid to swing open when lightly touched or, when lifted, stays open for easier disposal of oversized items. The lid helps hide contents from sight and contains odors. 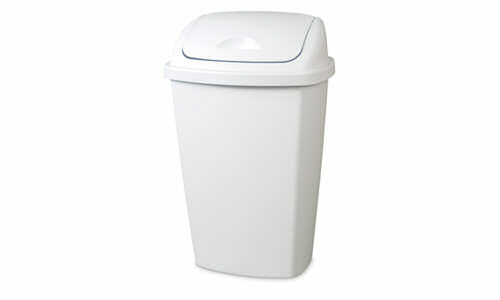 This wastebasket is ideal for use all around the home including in the kitchen, garage, basement or even the office. The sleek modern design complements any home decor. 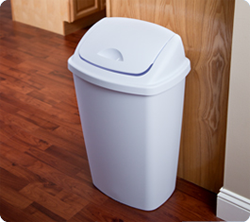 It accommodates a standard 13-gallon trash liner or can be used to collect recyclable materials. It is designed with a smooth-textured surface for easy cleaning. The overall dimensions of this item are 17 1/4" L x 13 1/2" W x 27" H.
Overall Assembled Size: 17 1/4" x 13 1/2" x 27"
Ideal for use in the kitchen. 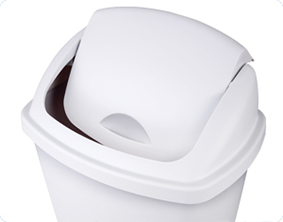 13.2 Gallon SwingTop Wastebasket is rated 3.5 out of 5 by 27. Rated 4 out of 5 by becc from Good can This trash can holds a lot of trash, and the swing top is a great feature. I don't find that it holds trash smells in very well though, and my lid often gets stuck if trash is piled up too high in the can. Overall, I'm happy with the product and wouldn't replace this can with another model. Rated 5 out of 5 by Retta from Perfect Solution I have this wastebasket in my craft room and I love it. The swing top works like a charm from either side. It is very easy to clean, which comes in very handy because I use a lot of adhesives and glues. The only thing I can think of that would make this better is a larger choice of colors. Rated 4 out of 5 by Woodie from Uses with minor problems I have 2 of the Black ones in my Kitchen. One for recycling and one for rubbish. I like the idea of the flip top cover, you don't have to see what is inside or if there is any smell involved. The two problems is finding bags that fit, They go on so tight. and after you have items in it, The cover will catch on what ever. That is why I gave it a lower score. Rated 4 out of 5 by Vitra27 from A low cost bin that functions as intended This garbage can is pretty standard and holds a decent amount of trash. Just make sure not to throw away too much or something long or it will stick up through the lid. I’ve had mine for about 3 years now and it’s still holding on strong. Rated 5 out of 5 by aagner5622 from Awesome These are perfect. Swing open with ease and close by themselves. Do not catch on anything, fit a 13 gallon bag perfectly and the way it is made, the bag does not even show. Would not change a thing. Have two in my kitchen. One for garbage and one for recycle. Had them for over a month. Rated 4 out of 5 by Sandyh from Long-lived durability We use this trash can next to the garage door at our home.It collects trash out of the car every day, it collects small limbs and leaves out of the driveway and whatever else it’s needed for. Sometimes we lose the lid and use it to collect yard debris and transfer it to the city garbage can. We have owned and used this particular unit for about 12 years or so. I don’t have a lot of things that I can say Ive had for 12 years. It’s been a steady Eddie for us. It’s a very convenient, easy way to help us keep trash where it belongs. The top does occasionally get yucky, but we are dealing with trash here. I clean it up and move on. It’s been a great unit for us!